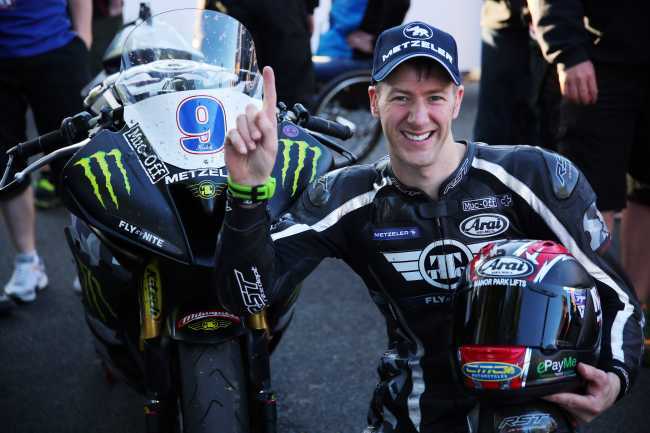 Ian Hutchinson took a fairytale victory in the opening Monster Energy Supersport race on Monday evening when he came home 7.7 seconds clear of New Zealand’s Bruce Anstey, reversing the result of Sunday’s RST Superbike race, with Gary Johnson in third. 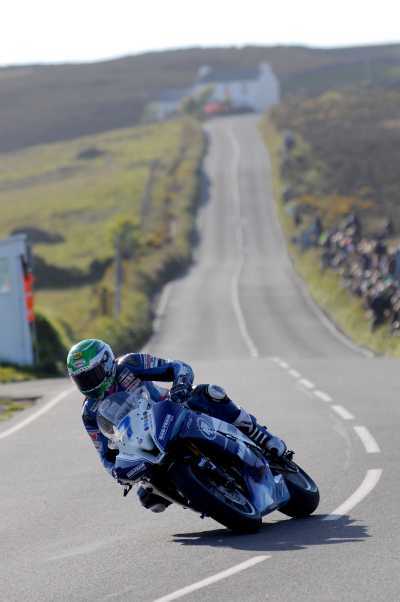 It was Hutchinson’s ninth TT win and completed his comeback from the career threatening leg injuries he suffered at the end of 2010, the year he won all five solo races. The riders enjoyed perfect conditions for the 6.30pm start and it was Johnson who led at Glen Helen on the opening lap by just over two seconds from teammate Dean Harrison. He in turn was only half a second ahead of Hutchinson who was almost dead level with James Hillier. Anstey and Lee Johnston filled out the remaining top six places. By Ramsey, Johnson had eked out a further half second but Hutchinson was up to second, half a second clear of Harrison who was leading on the roads having already overhauled John McGuinness. Anstey had taken over fourth from Hillier with Johnston holding on to sixth whilst Guy Martin was on the move and was now up to seventh. Hutchinson was making a move though and, having closed to within two tenths of a second at the Bungalow, his opening lap of 126.400mph saw him lead Johnson by 0.77s. Anstey was a further two seconds back in third ahead of Harrison, Johnston and Martin, Hillier dropping back to seventh. Glen Helen on lap two and Hutchinson’s lead was now over two seconds but it was Anstey who was now in second as Johnson slipped back to third albeit only seventh tenths of a second behind. Harrison was out though having retired at Crosby Crossroads with Michael Dunlop, down in 12th after the first lap, doing the same at Kirk Michael. Hutchinson continued to edge away as Anstey and Johnson almost matched each other all the way round, their times almost equal at both Ramsey Hairpin and the Bungalow timing points. Martin was also increasing his pace as just over ten seconds covered the top four but ninth placed Keith Amor tipped off at Stella Maris fortunately without injury. At the end of the lap, Hutchinson still led but Anstey had charged over the Mountain and a lap of 126.984mph allowed him to close to within 2.4s of the Yamaha man. Johnson was a further two seconds back in third with Martin in fourth but the latter was then hit with a 30 second penalty for speeding in pit lane, which dropped him down the order. Johnston and Hillier remained in fifth and sixth. Hutchinson’s team were the slicker at the solitary pit stop and by Glen Helen on lap three his advantage over Anstey had almost tripled to 6.6s. Johnson had closed up on Anstey too with less than a second separating the pair. The Bingley rider maintained his advantage throughout the lap and going into the fourth and final lap he held a six second lead from Anstey. Johnson appeared to be out of contention seven seconds adrift of the Kiwi but well clear of new fourth placed man Johnston. Anstey was mounting a last lap charge and got the gap down to five seconds at Glen Helen but Hutchinson responded immediately and was a staggering 2.5s quicker than his Honda rival on the run to Ballaugh which gave him a more manageable lead. The 35-year old Yorkshireman was able to control the race for the remainder of the lap and, with the fastest lap of the race – 127.571mph – he took the flag from Anstey and Johnson with Lee Johnston securing his best TT finish in fourth. Martin finished in fifth – which would have been fourth had it not been for the penalty – with Hillier having another good ride into sixth. 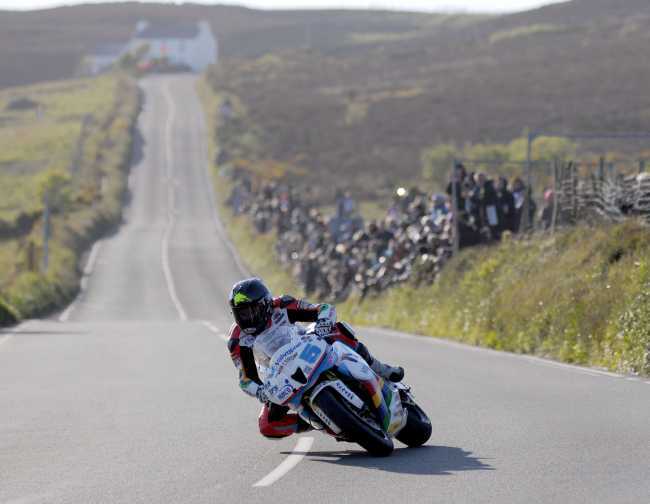 John McGuinness, Conor Cummins, Dan Kneen and Michael Rutter completed the top ten. Keith Amor was reported to have come off at Stella Maris but and was taken by airmed to Nobles Hospital with facial injuries. Earlier in the day William Dunlop was taken by airmed to Nobles Hospital and was reported to have broken ribs while in the Lightweight qualifying session Adam Child came off at Guthries and was taken to Nobles with an ankle injury. In the earlier Sure Sidecar race 1 Tony Thirkell and Dean Kilkenny had an accident at Windy Corner and the teammates were both transferred to Nobles Hospital with reported back pain and leg injuries respectively.